A breast lift with implants is a procedure designed to accomplish two separate goals: an increase in breast size along with the elimination of a “sagging” appearance. Medically referred to as an augmentation-mastopexy, breast lift with implants surgery from our board-certified plastic surgeon, Daniel C. Mills, MD, can provide beautiful, comprehensive breast enhancement by adding volume to the breasts while giving them a firmer, more youthful aesthetic. What Are the Benefits of Breast Lift with Implants Surgery? Breast lift with implants procedures offer a broad range of benefits for patients who want to completely renew the appearance of their breasts. While breast lift surgery and breast augmentation are some of the most popular and effective cosmetic enhancement options available, they are designed to achieve very distinct goals. A breast lift on its own cannot significantly enhance breast volume, and breast augmentation alone cannot typically provide an appreciable “lifting” effect. A breast lift with implants surgery from Dr. Mills can accomplish both of these goals with natural-looking results. What Does the Breast Lift with Implants Procedure Involve? In some cases, the breast lift with implants procedure can be completed in a single treatment session; however Dr. Mills typically prefers to perform this type of breast enhancement surgery in two separate operations for safety reasons. Once Dr. Mills has examined you and talked with you about your wishes during the initial consultation, he will determine whether a single-stage procedure or a two-stage procedure is the best option. The breast implant portion of this procedure is typically done first. There are a variety of breast lift with implant techniques that can be performed; Dr. Mills will talk with you about your options during the consultation and recommend the best technique for your needs. For some patients, the implants themselves will provide a degree of “lift” that may make a subsequent breast lift unnecessary to achieve their ultimate goals; however, this is not the case for most individuals, and the breast lift portion of the procedure will ultimately be necessary. During the breast lift stage of the treatment, excess tissue that is causing a sagging appearance will be removed and the remaining skin tightened. The breasts will be lifted to a higher position, allowing for a more youthful and “perky” appearance. Dr. Mills often uses the advanced GalaFLEX® Scaffold technique during the breast lift with implants procedure to restore structure to the breast tissue and help reduce sagginess. GalaFLEX® allows patients to keep the breasts higher and helps to prevent breast droop from reoccurring for much longer periods of time. Breast lift with implants surgery is usually performed on an outpatient basis while the patient is under general anesthesia. What About Recovery from Breast Lift with Implants? In general, patients who undergo breast lift with implants procedures are able to return to work in about one week to 10 days, and can start getting more active at two weeks following surgery. The expected length of recovery will ultimately depend on whether your procedure is staged over two operations or performed in a single treatment session; Dr. Mills will be able to give you a better idea once your treatment plan is created during the initial consultation. Some level of swelling and bruising in the breasts is common after this type of surgery. These effects should diminish gradually over the next few weeks and months. A surgical bra may be necessary for a few weeks following surgery to help the breasts heal. Post-surgery discomfort can typically be well-managed with medication. Dr. Mills advises patients to avoid lifting heavy objects and putting excessive strain on the breasts for a minimum of six weeks after breast lift with implants surgery to give the chest muscles time to heal. How Much Does Breast Lift with Implants Surgery Cost? A customized procedure such as breast lift with implants surgery will vary in price from one patient to another. A number of factors will be taken into account for the total cost of breast lift with implants surgery, including the complexity of the operation, the type of breast implants that have been chosen, the surgeon’s fee, facility and anesthesiology fees, GalaFLEX® material (if utilized), post-surgical garments, and other components. Here at the Aesthetic Plastic Surgical Institute, a breast lift with implants procedure typically ranges between $10,800 and $11,700 ($13,200 if GalaFLEX® is used), depending on the specific techniques performed and other factors (listed above). With that in mind, it’s important to remember that the total price of the procedure will ultimately be dependent on each individual’s unique treatment plan. Our team believes in providing an upfront cost estimate that includes all aspects of the treatment process so you will know what to expect. When your treatment plan is developed, a member of our staff will produce an estimate of the total cost and talk with you about the many payment methods our practice accepts. If you are interested in financing your procedure, we can also talk with you about plastic surgery financing options through CareCredit® and ALPHAEON™ CREDIT. These reputable lending agencies offer numerous flexible payment plans for qualified applicants, helping patients achieve their treatment goals with convenient monthly payment arrangements. How Noticeable Are the Scars from Breast Lift with Implants Surgery? Dr. Mills is extensively trained and experienced with this type of surgery and can utilize advanced techniques to minimize the appearance of residual scarring. He prides himself on his ability to create results that yield minimal signs of scarring, and he takes extra time during the procedure to ensure the best outcome possible. The extent of scarring will ultimately depend on the type of breast lift technique that is performed. In many cases, the breast implants can be placed via the incisions created from the breast lift, and thereby will not require additional incisions. While there will be noticeable scarring after this procedure, scars typically fade to some degree over time, and our practice has an at-home scar care treatment that we encourage our patients to use to decrease redness and diminish their appearance even further. If you would like to learn more about breast lift with implants surgery, or if you would like to meet with Dr. Mills for an initial consultation to discuss this advanced procedure, please contact us today. 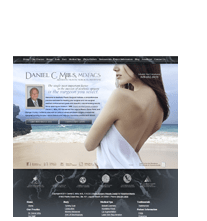 For information about other treatments available at our practice, including facial rejuvenation body contouring, and non-surgical cosmetic enhancement options, please visit danmillsmd.com.